Hitch up to multiple carts with the RTT-18 which is capable of moving up to 18.000 lbs. Electric tuggers are suitable to use in airports and warehouses. This electric tug is perfect for work environments that include trailer towing, aircraft towing, industrial applications, and heavy loads. Electric tuggers can be an excellent, cost-effective solution. Get a quote on the RTT-18 electric tugger and other aircraft tugs today! At the request of a major U.S. auto manufacturer, Eagle Tugs accepted the challenge of creating an industrial tow tractor that would allow them to standardize their global fleet. After years of research and design, with the collaboration of ergonomic and safety engineers and continuous feedback from tow tractor operators world-wide, the Eagle RTT was born. 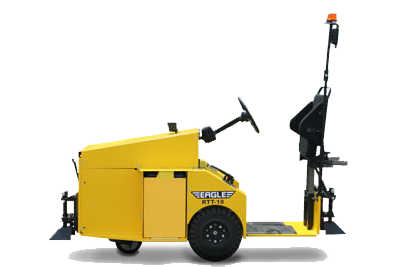 Eagle Tugs proudly introduces this new generation of electric tuggers that are energy-efficient, ergonomically-correct, and flexible enough to meet material handling needs across multiple manufacturing and distribution platforms. By choosing the Eagle RTT as the standard for your entire tow tractor fleet, the result is reduced cost of ownership by having one set of replacement parts, fewer maintenance personnel, and reduced operator and maintenance training time. Load Type Ideal for towing loads up to 18,000 lbs.